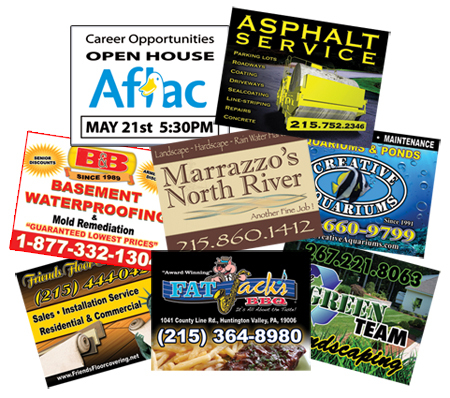 Apple Graphics designs and creates digital lawn signs for all types of businesses and purposes. The standard size of a lawn sign is 18" x 24", but we can make any size and shape that your business needs. Lawn signs are a great way to advertise and boost your business. They can be placed almost anywhere outside, which makes it convenient for hundreds of people to see each day. Any vehicle that drives by your sign, the passengers are sure to notice your business. Lawn signs are especially great since they can be moved around and placed all over your area. Lawn signs can be used for numerous purposes, such as grand opening signs, store sale signs, directionals, business advertising signs, landscaping signs, roofing signs, construction signs, community events, and more. Apple Graphics can make any quantity of sign you may need, whether its just a couple or hundreds of lawn signs. Our unique and custom designs will make your sign stand out. With digital imaging and printing, the possibilities are endless. Any idea or design you want, Apple Graphics can do! All of our signs are digitally printed vinyl, then applied to a coroplast substrate. The coroplast is durable outside and makes the sign sturdy. Each sign comes with its own metal stake to stick in the ground.